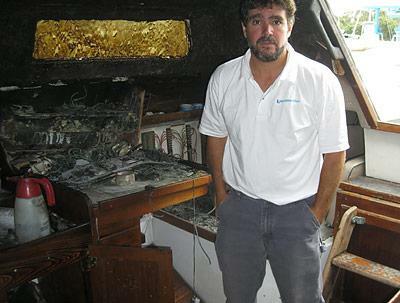 David Ryan, founder of Sailing Montauk, stood inside the charred cabin of his Catalina 38, which was struck by lightning in August. A week before Tropical Storm Irene ravaged the East Coast, David Ryan, the owner and founder of Sailing Montauk, was left with a lightning-charred Catalina 38, damaged beyond repair in a serious thunderstorm. But in the wake of that storm he turned his attention toward plans for a new and bigger boat — a 30-person catamaran that, when completed, will be the East End’s only United States Coast Guard-inspected sailing vessel legally allowed to carry more than six passengers, according to Mr. Ryan. He and his wife, Amelia Ryan, along with their two daughters, have been making passages together to the Caribbean and ports up and down the East Coast for years. They decided that this summer, they would take Mr. Ryan’s master captain license and lifelong love affair with the ocean and try to make a business of it. In June they launched the charter sailing business Sailing Montauk, outfitting his sloop, S/V Intemperance, as a family-friendly cruiser. By the end of the season, the S/V Intemperance had made almost 100 trips and carried 500 passengers. The reception was so good, in fact, that in mid-July Mr. Ryan started looking into building a bigger boat — he was tired of having to turn large groups of people down. When he discovered the storm-induced damage to the S/V Intemperance on that fateful morning, it only solidified his determination to get serious about what he is calling the Mon Tiki Catamaran Project. The night before, Mr. Ryan and his daughter had shut down the boat, closing hatches and through-holes with deliberate care. They knew a powerful storm was brewing. After taking his clients back to shore, he dashed down the companionway and sprayed it heavily with a fire extinguisher. Mr. Ryan isn’t exactly sure what happened, but believes that there was a flash ignition caused by the lightning’s electricity entering the wiring system of the boat, as there was no damage to the mast whatsoever. The adjuster declared it a total loss, as the cost to bring the boat back far exceeds its own value. “Her financial ashes will be the fertilizer for a new project,” Mr. Ryan said, adding that the Mon Tiki Eco Catamaran will be a boon to the local economy. Financing has been secured and the full building plans are under review by John Marples, an expert in the construction of boats that can pass the U.S. Coast Guard Inspected Passenger Vessel Certification. Mr. Ryan anticipates a final approval at the end of October, with the four-month construction slated to begin in December. He is looking for a construction site for the Tiki, hoping to have it built on the East End by local craftsmen using low-impact materials. He believes the boat will serve as a “working testament” to the skills and ingenuity of the local community.